Today’s recipe is doraji-muchim. Doraji (known as “bellflower,” “balloon flower,” or platycodon in English) is grown wild in the mountains and fields of Korea. The root of the bellflower looks similar to ginseng root and tastes bitter with strong ginseng-like smell. 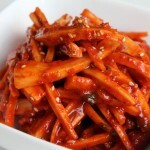 It’s not only used to make delicious side dishes but it’s also used in Korean traditional medicine and home remedies. You can make this dish with either fresh or dried doraji root. If you get fresh doraji, you’ll have to peel it and split it lengthwise into bite sized strips. Then soak the strips in salty water for a couple of hours, drain the water, rub them by hand, and rinse in cold water. Repeat this until they aren’t so bitter anymore. Taste a small sample of the root to test. Dried doraji sold in a package is more convenient for making doraji side dishes because all you need to do is to soak the roots in water and rub them with a little salt to remove the bitterness. Then you can make delicious side dishes by mixing them with seasoning sauce, stir-frying, or making pancakes with them. 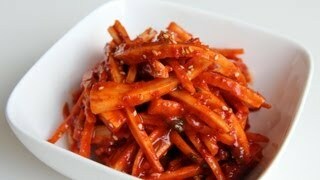 The most common side dish made with bellflower roots is doraji-muchim, so let’s start with this recipe. I’ll post more in the future. If you want to add cucumber, slice it and mix with some salt in a small bowl. Then squeeze out the excess water from the cucumber with a cheesecloth and mix with the bellflower root and the seasoning sauce. Soak dried bellflower roots in cold water overnight (for 8 to 12 hours) until the roots are soft. Drain and scrub with about 1 Tablespoon of coarse salt to remove the bitterness. Rinse and drain. 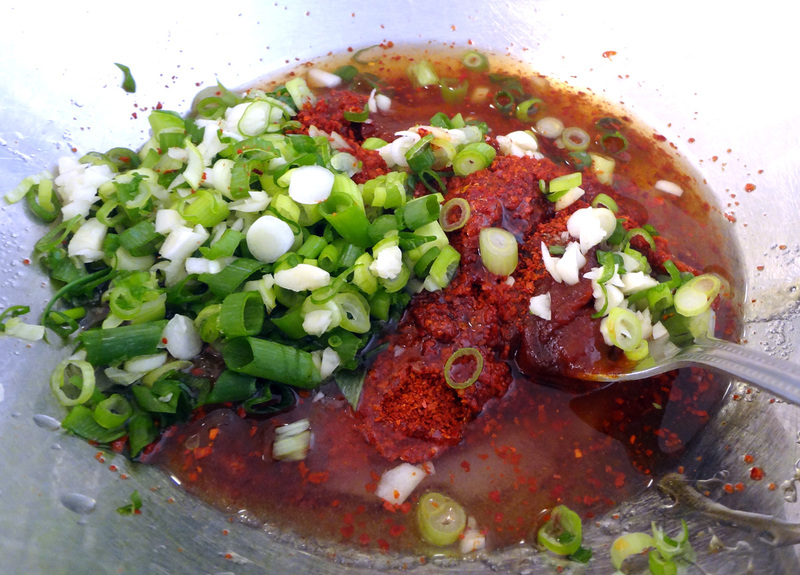 Combine the hot pepper paste, hot pepper flakes, soy sauce, rice syrup, sugar, salt, vinegar, garlic, green onion, and sesame oil in a mixing bowl. Add the dried bellflower roots to the paste and mix it all together by hand. Sprinkle with sesame seeds and transfer it to a serving plate. Serve with rice, and the leftovers can be stored in the fridge for 3-4 weeks. Posted on Wednesday, August 15th, 2012 at 4:17 pm. Last updated on August 8, 2017. Posted July 14th, 2015 at 6:41 pm | Log in to reply. Oh! I am so happy to have this recipe. I have made it 2 times in 3 days because we are eating it so well. My children eat it and then drink a bunch of water. Who cares if it is spicy when it is so delicious!! Posted July 15th, 2015 at 6:12 pm | Log in to reply. I’m glad you and your family enjoy this dish! Posted July 9th, 2014 at 8:39 am | Log in to reply. You site came up first on Google for “root used for cooking Korea.” I searched this because I am visiting Seoul, and my hotel serves Kimchi, which I love. They serve another dish, which I like just as much, and it felt like chopped carrots to me. So I asked what it was, and they showed me a picture of something that looked like a cross between a turnip and a carrot, and said it in Korean. Of course, I was clueless, until I found your site and see this is a Bellflower root. I think this might be the perfect Asian dish. It intersects perfectly from all directions — sweet, spicy, crunchy, meaty, rich… Just fantastic. Thank you so much for posting this! Posted February 3rd, 2014 at 8:00 am | Log in to reply. Great recipe ! I added some carrot. Hmm delicious ! Posted September 30th, 2013 at 12:23 am | Log in to reply. I use fresh doraji and just scrub it once with salt then rinse thoroughly before I mix it into the sauce. OMG, it’s very tasty and my mom thought it was young ginseng. 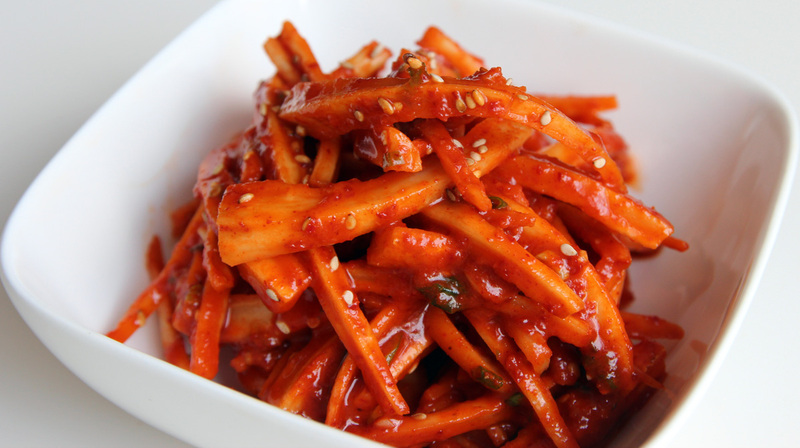 The mixture of flavors of slight bitterness with sweet savory from gochujang and ganjang is intoxicatingly delicious. Thanks for such an awesome recipe. We finished the whole thing in one day. Posted October 1st, 2013 at 6:14 pm | Log in to reply. “my mom thought it was young ginseng” yes, it tastes like ginseng, right! Posted February 16th, 2013 at 6:31 am | Log in to reply. 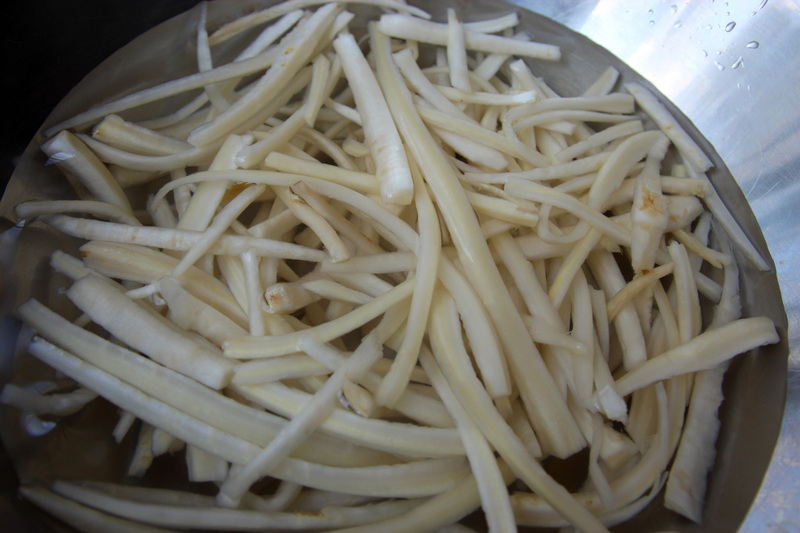 If you are using fresh bell flower root, how much do you use in the recipe? Posted October 30th, 2012 at 9:57 am | Log in to reply. I can’t find rice syrup. Can I use corn syrup instead? Posted September 17th, 2012 at 10:31 pm | Log in to reply. Hi Maangchi Shi! Someone just sent me a huge box of 더덕…what can I do with it? Could I use this recipe? Posted September 8th, 2012 at 12:15 pm | Log in to reply. Posted September 9th, 2012 at 9:50 am | Log in to reply. Posted August 20th, 2012 at 4:50 pm | Log in to reply. Posted August 17th, 2012 at 12:00 am | Log in to reply. I really love your site so I always watch your cooking vedio. I favor for you can you please show me or us how to make “오리탕”. Because i love that recipe but I dont know how to make it please…. Posted August 17th, 2012 at 12:01 am | Log in to reply. I mean I have a fovor for you sorry. Posted August 21st, 2012 at 8:58 am | Log in to reply. Posted August 16th, 2012 at 12:30 pm | Log in to reply. Maangchi, I have a rice cooker like yours. What setting do you use for your multigrain rice? Posted August 16th, 2012 at 8:21 am | Log in to reply. Looks mouth watering delicious as do all of your recipes Emily!!! Cheers to you sweetie! Have a great day!!! Posted August 16th, 2012 at 9:18 am | Log in to reply. This side dish is really tasty. I will make it again today. Posted August 16th, 2012 at 5:00 am | Log in to reply. Thank you for this recipe! I’ve seen doraji many times at the dried foods section of my Korean store in Adelaide and always wondered what or how to to use and prepare them. Now I get an idea! Will definitely be in my basket come market day! Posted August 16th, 2012 at 9:20 am | Log in to reply. I can imagine a package of dried bellflower roots in your basket! : ) Good luck with making delicious crispy dorajimuchim! Posted August 15th, 2012 at 5:03 pm | Log in to reply. This sounds so delicious! Now I’ve got to get into Anchorage and find some doraji. Posted August 16th, 2012 at 9:21 am | Log in to reply. This recipe was originally posted on August 15, 2012 at 4:17 pm by Maangchi. It was last updated on August 8, 2017. The video was watched 148,025 times on YouTube & has 1,532 likes!